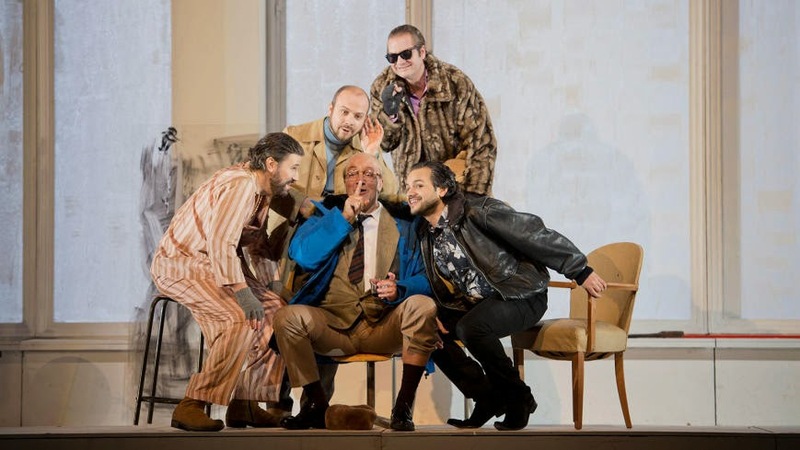 Benedict Andrews' production of La Boheme at Dutch National Opera. 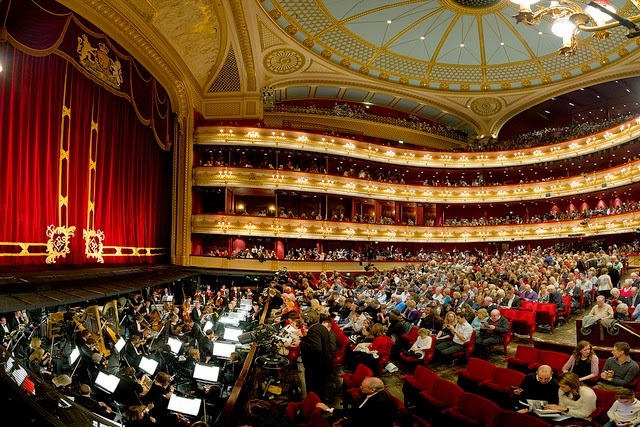 English National Opera has announced a 2015/2016 season which is remarkably confident and shows that artistic director John Berry is intending to stick to his guns and develop the company's distinctive brand. There are new (to London) productions from Dmitri Tcherniakov, Benedict Andrews, Calixto Bieito, Christopher Alden, Phelim McDermott and Daniel Kramer with Tristan and Isolde, Lady Macbeth of Mtsensk, The Force of Destiny, and Akhnaten, four operas which have strong historical resonance for the company, all making a welcome return to the Coliseum stage and Norma coming to ENO for the first time. It is possible detect hints of ENO simply going shopping for suitable productions in this selection of co-productions, which may be a result of ENO's current economics, and can be seen as a canny way of getting greater leverage. Tcherniakov's Lady Macbeth of Mtsensk for instance is much travelled, having been created for Deutsche Oper am Rhein, this outing is a co-production between ENO and Opera de Lyon. Norma is borrowed from Opera North for whom it was created (with Die Theater Chemnitz). Calizto Bieito's new Force of Destiny is a co-production with the Met in New York, and we wonder what that house will make of Bieito's particularly potent blend of Euro-trash? All this has to be paid for, of course. Listening to soprano Gillian Keith's recent disc of early Debussy songs, I was struck by the rather dramatic story behind them. This thought clearly occurred to Gillian Keith as well as she has developed Debussy and his muse: the story of Achille Debussy and Blanche Vasnier in words and music which Gillian Keith and pianist Simon Lepper premiered at Wilton's Music Hall last night (28 April 2015). 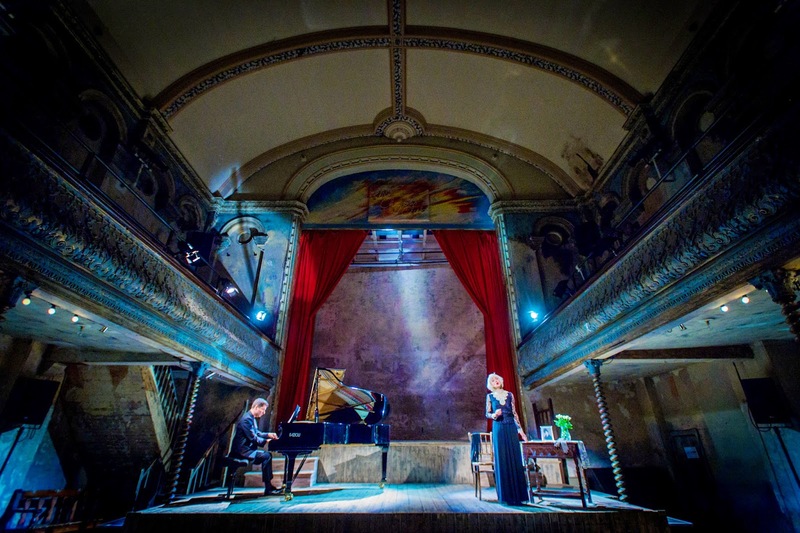 Directed by Nina Brazier, the show consisted of Debussy's songs with a linking dramatic narrative which was written and performed by Gillian Keith. She has mined letters and other writings by Debussy and his contemporaries to put the creation of the early songs into context. In order for it not to turn into a lecture, Gillian Keith created a dramatic context by performing the whole evening as Marie-Blanche Vasnier's daughter reminiscing to us. This could have been a rather arch concept, but Gillian Keith's performance was so beautifully direct and full of charm that instead she drew you into the story. And what a story it was! Max Mausen is a young clarinettist, born in Luxembourg, he trained at the conservatoire there and at the Guildhall School of Music and Drama, and he is now principal clarinettist of the Malta Philharmonic Orchestra. Like many artists, he has moved into producing his own CD as a showcase for his considerable talents. 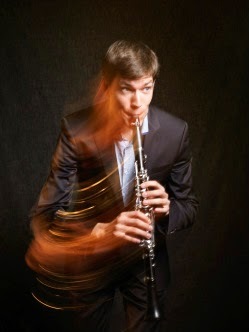 The new disc, New Waves, has Max Mausen partnered by pianist Jason Anderson in Claude Debussy's Premiere rhapsodie, Igor Stravinsky's Three Pieces for Solo Clarinet, Tryptique by Ivan Boumans and Walthamstow Fall by Jason Anderson and Mausen himself. Max Mausen and Jason Anderson open with Debussy's Premiere rhapsodie for clarinet and piano, which was written in 1910 as an examination piece for the Paris Conservatoire and it is Debussy's only major work for solo clarinet. Max Mausen creates a long lyrical line, to which he gives a lovely endless feel, playing with seductive yet clear tone. He and Jason Anderson capture the atmosphere of mystery about the piece and technically both are superb, in both the lyrical sections and the cascades of notes at the end. Jason Anderson's piano is captured rather over resonantly on the recording. 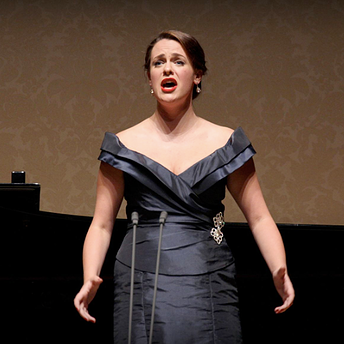 This year's Ferrier Awards had their final last week at the Wigmore Hall when soprano Gemma Lois Summerfield took the First Prize and the Song Prize, whilst soprano Soraya Mafi took the Second Prize. Gemma Lois Summerfield sang Sibelius, Mendelsson, Duparc, Copland and Nicolai, and was accompanied by Sebastian Wybrew. Soraya Mafi was accompanied by Ian Tindale who took the accompanist's prize. Gemma Lois Summerfield is currently studying for a Master’s in performance at the Royal College of Music under Rosa Mannion and Simon Lepper and will take up a place at the International Opera School there in September. 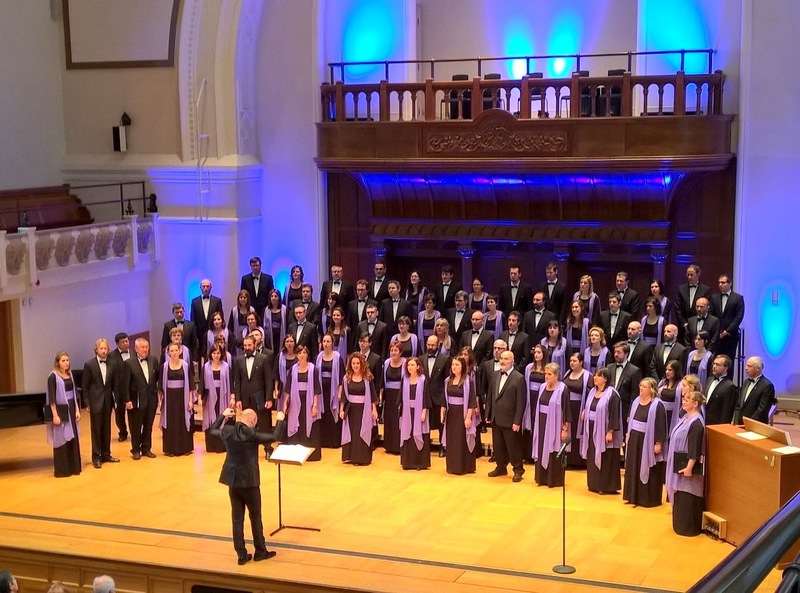 The Catalan choir Orfeo Catala, with its conductor Josep Vila i Casanas, made its Cadogan Hall debut at a lunchtime concert on Sunday 26 April 2015 as part of the Choral at Cadogan series. The choir brought a programme of music by Catalan composers, all but one of whom had links to the choir. The music included the recently rediscovered El cant de les estrelles (Song of the Stars) by Enrique Granados (with Albert Guinovart, piano, and David Malet, organ), plus music by Casals, Josep Reig, Eduard Toldra, Enric Morera, Xavier Montsalvatge, Josep Vila i Casanas and Bernat Vivancos. Founded in 1891, Orfeo Catala is one of their country's top amateur choirs, performing major works from the Western classical canon alongside music by Catalan composers. The choir is based at the Palau de la Musica Catalana, the Art Nouveau music hall in Barcelona which was built between 1905 and 1908. The choir opened with a work which it premiered in 1911, El cant de les estrelles by Enrique Granados (1867-1916). The manuscript for the work was thought lost and only recently surfaced, enabling them to give a second premiered in 2007. At the first performance in 1911, Granados himself played the piano part and work is more like a concerto with the piano accompanied by the choir, which is supported by the organ. The text (O, infinite vastness and stillness of space...) is based on Heine, but is not attributed and commentators have wondered whether it might be by Granados himself. Trinity Laban Conservatoire of Music and Dance's Royal Greenwich String Quartet Festival seems to be becoming a triennial event. This year's festival is the third (previous ones were in 2009 and 2012), with artistic director David Kenedy (Head of String Chamber Music at Trinity Laban). Taking place this year on 24 and 25 April 2015, it packed Greenwich with string quartets and film music (proving the two not incompatible) with evening performances from the Wihan Quartet and the Carducci Quartet, the Quatuor Prima Visa accompanying a filming of the silent film Nosferatu, the Richard Carne Intercollegiate String Quartet Competition and a concert by the winners of the Wigmore Hall String Quartet Competition, Quatuor Van Kuijk. 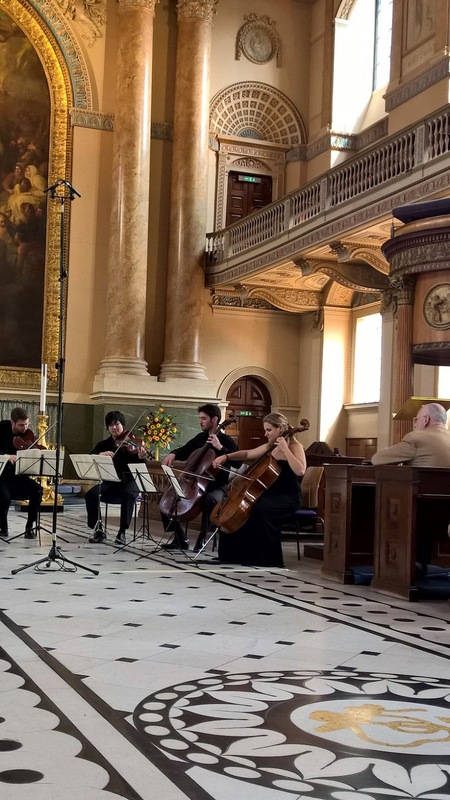 I went along on Friday 24 April 2015 for a couple of daytime events; a joint concert by the Piatti Quartet (who were also finalists in the Wigmore Hall String Quartet Competition) and Benyounes Quartet in the Chapel of the Old Royal Naval College, where they performed Gershwin, Bernard Herrmann and Mendelssohn's Octet, and then a joint concert by pupils from the Purcell School and Trinity Laban String Ensemble conducted by Nic Pendlebury (Head of Strings and member of the Smith Quartet). The chapel at the Old Royal Naval College is a remarkable interior. Amidst all the Wren baroque, here is a very elaborate Athenian Stuart 18th century interior, heavy with plasterwork in pastel colours. Now that Trinity Laban has moved in, it means that it is the only UK conservatoire with its own chapel, and you can hear sung Evensong on Mondays. William Vann's London English Song Festival is returning on 3 June 2015 with eight concerts which really live up to the festival's name as during these concerts all of RVW's original songs are being performed. Thus giving us a chance to assess the lesser known works alongside the better known ones. 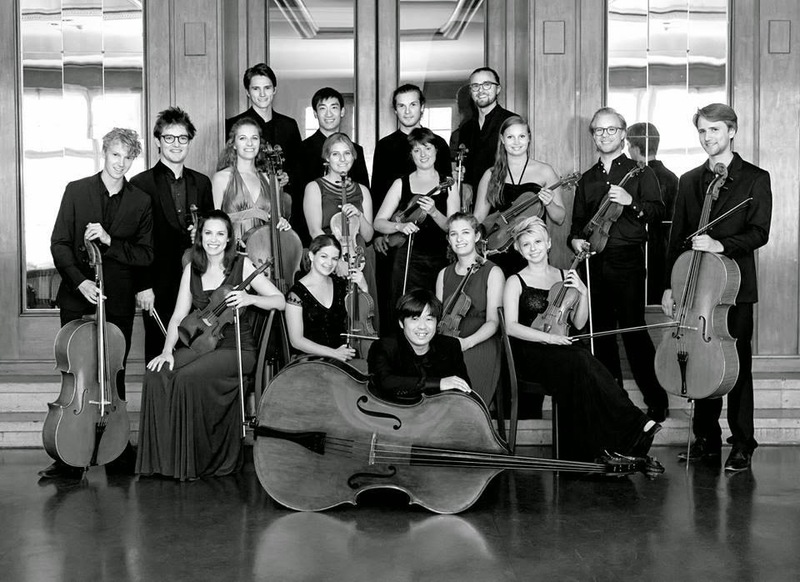 The festival starts on Wednesday 3 June 2015 and runs until Thursday 11 June and all concerts are at St George's Church, Hanover Square with a number of early evening concerts too. 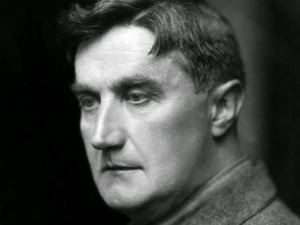 The opening concert is Vaughan Williams and Folk-Song with soprano Louise Kemeny, baritone Gareth John and William Vann. Then soprano Raphaela Papadakis and violinist Alessandro Ruisi explore the songs for voice and violin, with mezzo-soprano Katie Bray, baritone Johnny Herford and William Vann in RVW's Rossetti settings (both concerts 4 June). On 5 June baritone Roderick Williams joins mezzo-soprano Clare Presland and Iain Burnside for RVW's RL Stevenson settings Songs of Travel plus early songs and the wonderful Four Last Songs. Soprano Eve Daniel, mezzo-soprano Marie Seidler, tenor John Porter, baritone Henry Neill and Frederick Brown give us songs from the operas, followed by mezzo-soprano Ciara Hendrick and baritone Jonathan McGovern with Vann in songs by RVW and his contemporaries (both concerts 9 June). Soprano Mary Bevan and tenor Alessandro Fisher are joined by Matthew Scott (clarinet) and James Turnbull (oboe) and Vann, for songs for voice and woodwind (10 June). 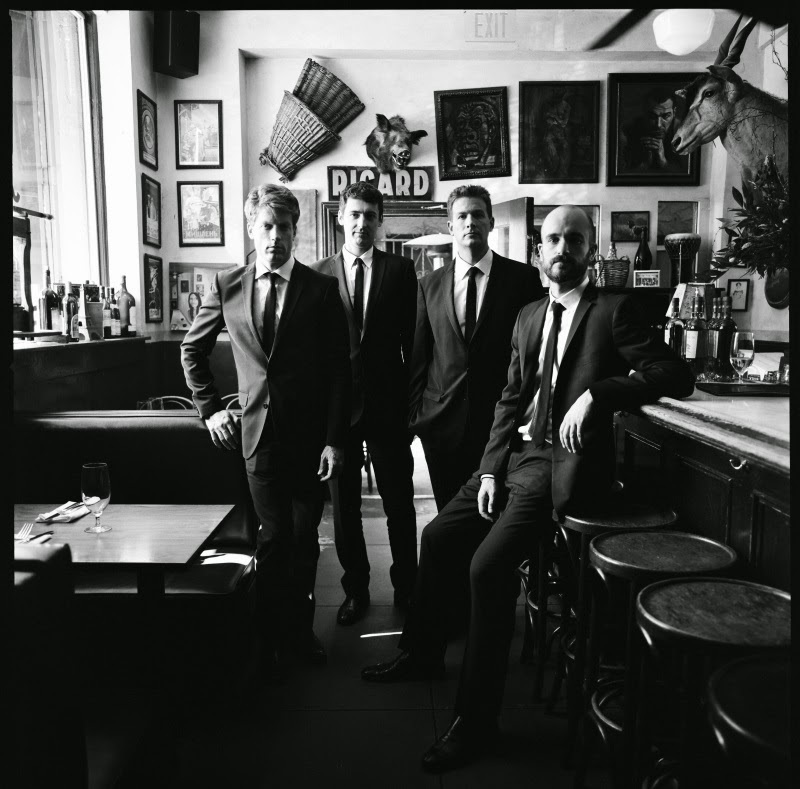 The festival finale sees Vann, the Benyounes Quartet and tenor Nicky Spence in On Wenlock Edge (11 June). Further information and booking from the Cadogan Hall website. As part of Kings Place's ongoing series on minimalism the Labèque sisters and UBUNOIR performed a mixture of Philip Glass, David Chalmin, and works by the New York street artist Moondog. 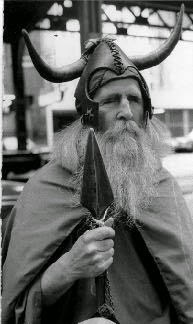 Louis T. Hardin (1916-1999), better known as Moondog or 'the Viking of 6th Avenue', had been experimenting with the same minimalist techniques as Glass, Reich, Riley and Young – only he was doing it ten years earlier. He was quite a character. Opposed to capitalist exploitation he lived on the streets of Manhattan (despite owning property upstate and an apartment in Manhattan) and wrote all his music in Braille having been blinded as a teenager due to an accident with fireworks. In 1974 he moved to Germany, leading many of his New York fans to believe that he had died. However while in Germany he continued to write music and many of his compositions were transcribed into sheet music by Ilona Sommer. His compositional style is characterised by his passion for Native American and world music and by his use of the ambient sounds around him such as cars, horns, and the subway, and by treating musical elements as though they were the repeated noises which fascinated him. Minimalist composers like Philip Glass were strongly influenced by the work of Moondog. In 1989, during a rare visit to America, Glass asked Moondog to conduct the Brooklyn Philharmonic Chamber Orchestra returning him to the public eye. Now in their third year, the Opera Awards looks set to be a fixture of operatic life, giving the opera world a chance to reward its own. This year the awards ceremony took place at the Savoy Theatre, which meant a rather better acoustic then previous years for the live performance element of the evening, though did necessitate climbing a remarkable number of stairs between the reception in the Savoy Hotel and the Savoy Theatre. The ceremony itself was hosted by the actor Richard E Grant, and we were treated to live performances from Carolyn Sampson, Justina Gringyte, Lawrence Brownlee and Aleksandra Kurzak. 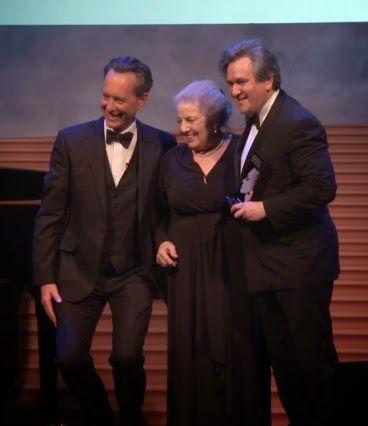 In a packed programme, the awards for Male Singer went to Christian Gerhaher, Female Singer to Anja Harteros and Conductor Semyon Bychkov (none alas able to receive in person) and Director to Richard Jones, with a Lifetime Achievement going to Speight Jenkins. The ceremony was pre-fixed by a reception in the ballroom at the Savoy Hotel, which was a chance for people to meet and congratulate, and catch up with old friends. I was able to catch up with a number of singers whom I normally only see across the footlights, and to chat about roles old and new. The potential recipients for the awards are selected and judged by a jury of those working in opera, which this year consisted of Per Boye Hansen, Artistic Director of Norwegian National Opera and Ballet, John Allison, Editor of Opera, Nicholas Payne, Director of Opera Europa, Erna Metdepennighen, formerly of De Standaard (Belgium), Hugh Canning, chief music critic of The Sunday Times, Kathryn Harries, Director of the National Opera Studio, Peter Alward, Intendant of the Salzburg Easter Festival, Hugo Shirley, Recordings Editor of Gramophone, Evans Mirageas Artistic Director of Cincinnati opera, and George Loomis, critic for International Herald Tribune. 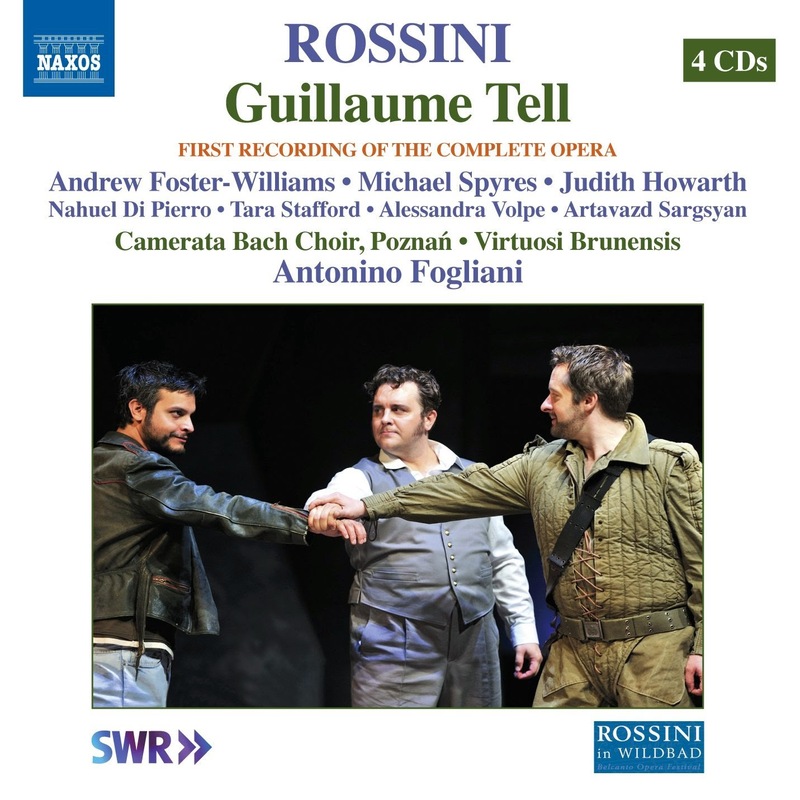 I have long been looking for a recording of Rossini's Guillaume Tell to set beside the classic one from Lamberto Gardelli with Nicolai Gedda and Montserrat Caballe. I don't have huge requirements but it has to be in decent French, and be reasonably complete. 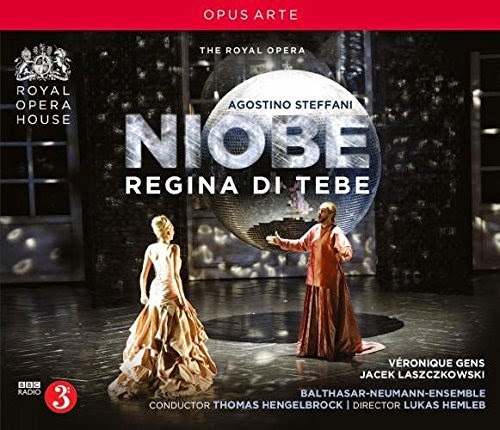 The first requirement rules out a few and the second rules out the recent recording from Antonio Pappano with John Osborn and Malin Bystrom, because it uses the shortest and most unsatisfactory of Rossini's versions. This new recording on Naxos, was made live at the Rossini in Wildbad Festival. It contains the first recording of the complete opera (quite what complete means I will come to later), in French with Andrew Foster-Williams in the title role, Michael Spyres as Arnold, Judith Howarth as Mathilde, Tara Stafford as Jemmy, Alessandra Volpe as Hedwige, plus Nahuel di Pierro, Raffaele Facciola, Giulio Pelligra, Artavazd Sargsyan, Marco Filippo Romano, with Camerata Bach Choir Poznan and Virtuosi Brunensis conducted by Antonino Fogliani. When Rossini planned Guillaume Tell it was to prove rather expansive, so after he had written the skeleton score but before fleshing out he cut a few items. 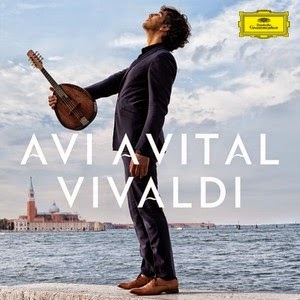 A few numbers were cut during rehearsals, and then after the premiere cuts were made and further cut were made after subsequent performances so that when Rossini left for Bologna we have the most compressed four-act version (the one recorded by Pappano). Rossini was a man of the theatre, he made the trimming because he wanted to be in charge of it and in the theatre this version (or one based on it with extra items) is understandable given the length of the piece and the stamina required. But on CD we need something closer to what Rossini intended. On this new disc we get the work as close as possible to that originally conceived by Rossini, with items cut during rehearsals restored as well. There is also an appendix, with different versions of the items. The opera is spread out sensibly over four discs with one for each act (something which Naxos's pricing makes affordable). Multi-layered Pagannini Caprices, playing in a volcano and writing modern baroque music, all this and Mozart with the Philharmonia Orchestra. 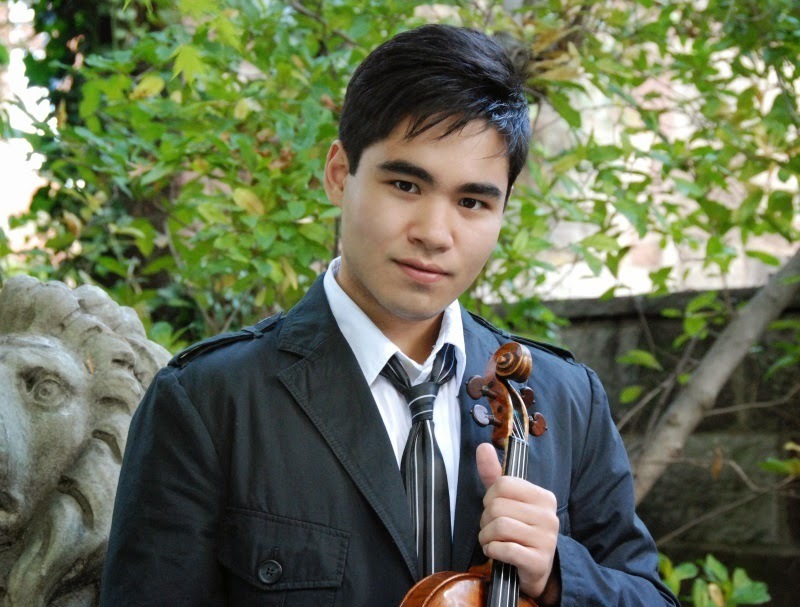 My encounter with violinist Eric Silberger. The young American violinist Eric Silberger has just made his debut with the Philharmonia Orchestra (18,19 April 2015) performing Mozart's Violin Concerto No. 5 with Vladimir Ashkenazy. Eric Silberger has been busy travelling recently; in Spain in March touring with the Berlin Konzerthausorchester and Dmitri Kitajenko in Brahms Violin Concerto, off to Denmark to play the Mozart again, with the Danish National Symphony Orchestra and Robin Ticciati, and Romania in June for the Beethoven Violin Concerto. I met up with him, en route for rehearsals, to chat about his career so far, and his plans. In any performing career there are things that the performer does which they enjoy and others less so, but which might seem necessary. In Eric's case, he has managed to catch the imagination with a couple of events out of the way of regular performances. One is his recording playing inside a volcano, and the other is the layering of all 24 of Pagannini's Caprices on top of each other (you can see this on YouTube). I am curious about the volcano stunt, and Eric says that he did it because it was on his bucket list. He has what he terms 'something of a history with volcanoes', the ash cloud prevented him from getting to Norway for a concert, but another ash cloud did not prevent him getting from New Zealand to Russia. So when the opportunity came to play in the volcano he took it. Eric is also interested in how you might reach more people by changing the context of the performance, so felt that this was a great idea of moving outside the regular concert hall. Dina Duisen is a young pianist from Kazakhstan who has studied in her native country and America before coming to London and completing her studies at the Royal Academy of Music. 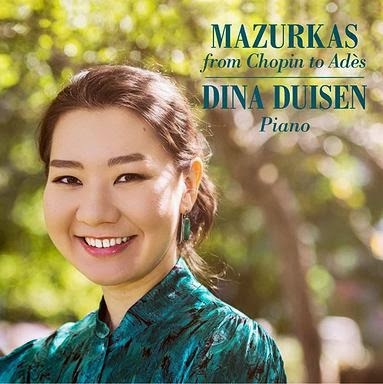 On this disc, designed to showcase her talents, she has put together a rather imaginative programme which takes the Mazurka on a journey from Chopin to Thomas Ades, along the way we hear music by Liszt, Saint-Saens, Tchaikovsky, Lyadov, Albeniz, Arensky, Debussy, Delius, Sibelius, scriabin, Gliere, Szymanowski, Prokofief and Ades. The mazurka was originally a Polish folk-dance in triple-time with the accent on the second or third beat. Whilst Chopin was inspired by November Uprising in Poland to use a traditional Polish form, in fact his mazurkas are his effectively his own, newly invented form. 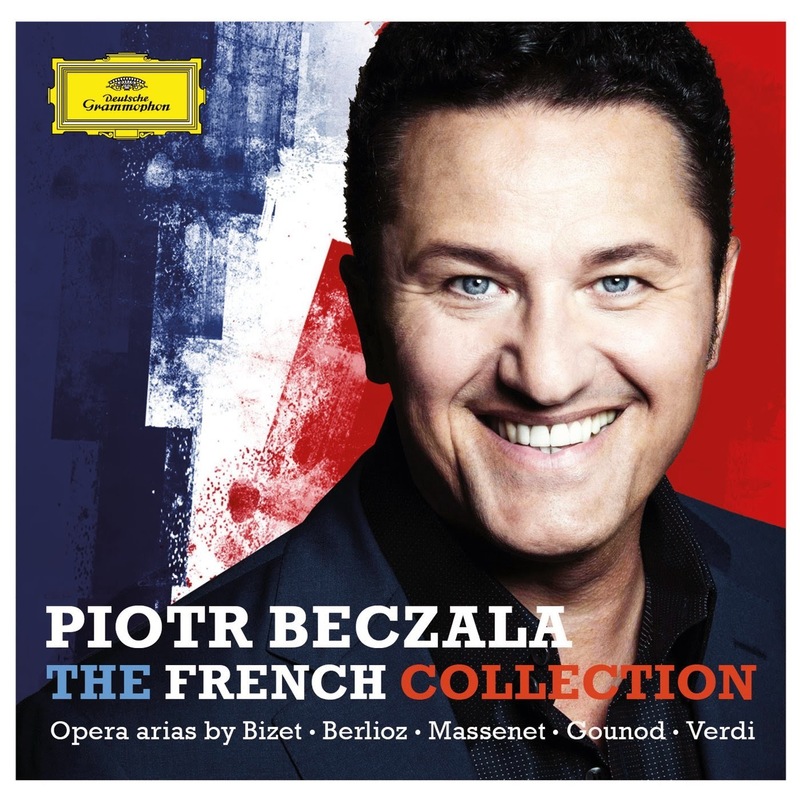 The fascinating thing about this disc is how we can watch different composers reacting differently to the genre. Some create a work which is clearly a study like Chopin's, others take a very rhythmic view clearly owing a lot to the work's folk origins and other simply write salon music. Not every composer's voice is recognisable in his work. some write generic salon pieces which charm or show off, whilst others bring their own distinctive voice directly to bear. 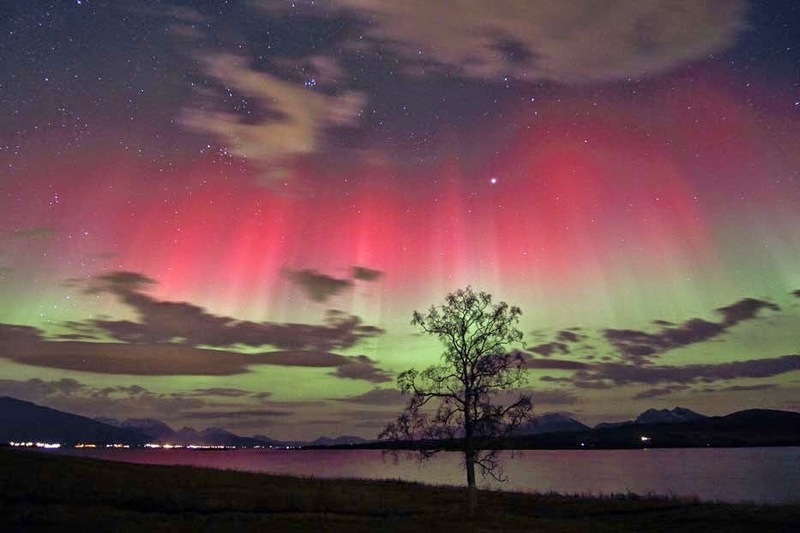 The choir Voxcetera and the Northern Lights Symphony Orchestra, with conductors Adam Johnson and Jane Hopkins, will be performing Vivaldi's perennial Gloria at St Martin in the Fields on 28 April 2015, but it is in the smaller work which are also in the programme that the concert's main interest lies. The Northern Lights Symphony Orchestra specialises in the music of Northern composers and this concert is no different. There will be two Icelandic works, Jón Leifs' Consolation, Intermezzo Op.66 for orchestra, and Sigurbjörnsson's simple, beautiful setting of the ancient Icelandic text Heyr Himna Smiður for a cappella choir, plus the Magnificat by the Estonian composer Arvo Pärt (who is 80 this year). Also in the programme are Gabriel Jackson's Salve Regina, Francis Poulenc's Exultate Deo and music by Morten Lauridsen. Tickets and further information from the St Martin in the Fields website. Three Tales (1998-2002) is one of Steve Reich's video operas created with the video artist Beryl Korot (the two are married). In form Three Tales echoes their first essay in the genre The Cave (1990-93). Three Tales made a reappearance in London at the hands of Ensemble BPM at the Science Museum's IMAX Cinema on 22 April 2015. The venue and the date are significant. 22 April is the centenary of the first use of nerve gas in World War One, a date which marks the commencement of our fascination with weapons of mass destruction and the subject of a conference whose delegates attended the performance of Three Tales. The piece was conducted by Nick Sutcliffe in a production directed by Matthew Eberhardt, designed by Gillean Denny with lighting by Stuart Webb. Three Tales takes three episodes in 20th century history chosen as key moments, examining man's relationship to technology. The first, the Hindenberg Disaster, when the German passenger airship crashed in 1937 killing 36. 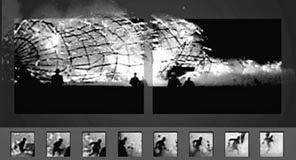 The first disaster to be captured on cinema newsreels. The second, the bombing of Bikini atoll, as part of the USA's atomic tests in 1946-1958. The third, the successful cloning of Dolly the sheep which led to a greater consideration of man's relationship to technology. 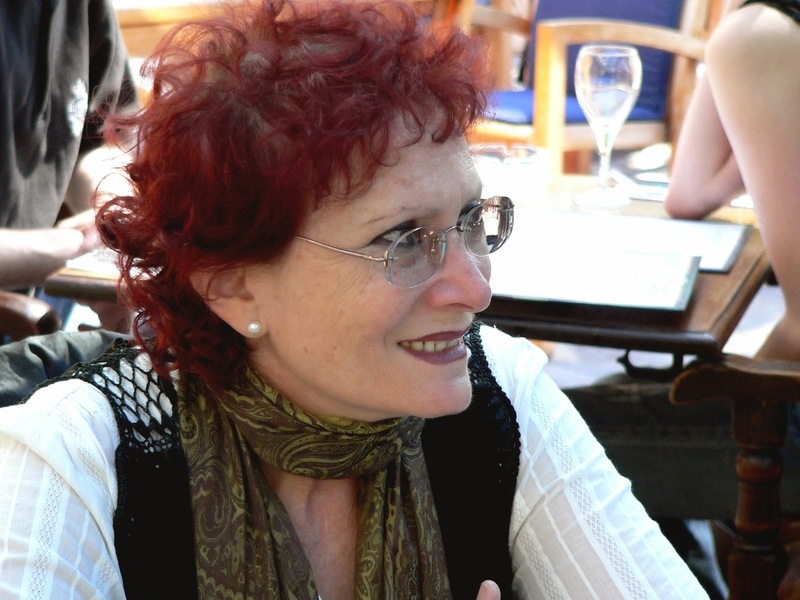 Beryl Korot's video uses archive footage and interviews, intercut and re-purposed; though there is a documentary narrative element, this is combined with a thoroughgoing artistic viewpoint. The sound-track combines found sound, original sound-track and Steve Reich's music. Much of the music originated in Steve Reich's technique of shadowing the vocal inflections exactly, mimicking the person's intonations. All this combined with live musicians via a click track. Playing live Ensemble BPM consisted of two pianos, two vibraphones, two drum kits, the Ligeti String Quartet and Synergy Vocals. Laid out in front of us, they looked remarkably factory-like, a machine for creating music. All of course were miked. Like the Royal Opera, the Royal Ballet's 2015/16 season is a balance between revivals of old warhorses and new work. There is an admirable support for continuing new three act ballets, and my only real grouse is that the revivals of core repertoire from Kenneth Macmillan and Frederick Ashton play it rather safe. So the notable news is the new Frankenstein from Liam Scarlett and the revival of Christopher Wheeldon's The Winter's Tale. The season will also be the first with Koen Kessels as the music director of the Royal Ballet. A slightly more worrying feel, is the sense that the number of performances in the house is not keeping pace with the number of opera performances, partly this is because Kasper Holten and his team have been very adept at using the Linbury for smaller performances which complement the main house season, and there are many new operas being performed there in 2015/16 (see my preview of the 2015/16 opera season). Though the new Royal Ballet season does something similar, with performances from company's such as Québécois company Cas Public, and Martha Clark, the numbers are far smaller. Not for the first time, you feel that ballet just isn't quite as important as opera. Still, there is much to look forward to. Time is not kind to the lyric soprano voice and most choose to either move into another fach, or to stop performing. Only a few decide to grow older disgracefully and continue, relying on strength of technique to replace to the natural flexibility of the voice. One such is the Romanian/British soprano, Nelly Miricioiu who, now in her 60's, continues to combine a performing career with extensive teaching. 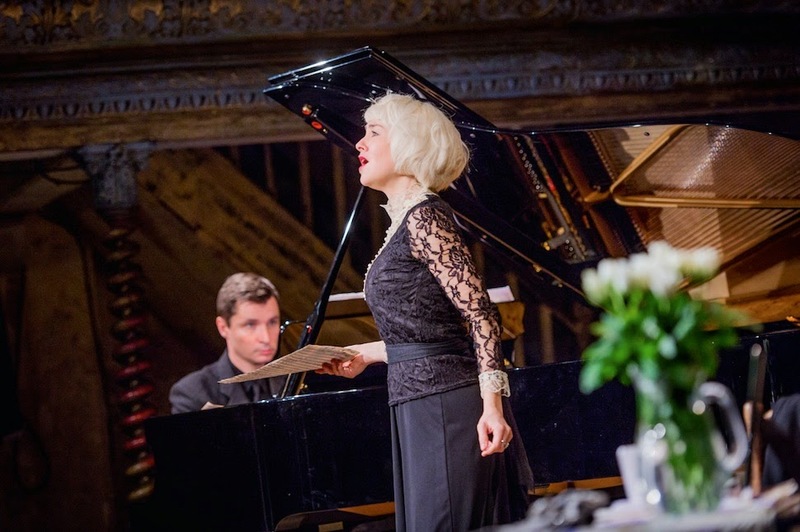 She made a rare recital appearance at St John's Smith Square, on Tuesday 21 April 2015 with David Gowland at the piano in a programme of songs by Ravel, Chausson, Chopin, Brediceanu and Respighi, and arias by Bellini, Rossini, Puccini and Verdi. It wasn't an easy programme, and though in some ways the songs in the first half seemed to be more of a warming up for the main course of arias, even these required strong technique and sterling lungs. Nelly Miricioiu and David Gowland started with Ravel's Cinque melodies Populaire Grecques. Her voice seemed to take some time to warm up, but the plangent tones and slight edginess in the timbre suited the material very well and she finely matched tone and mood of the words to the colours in her voice. 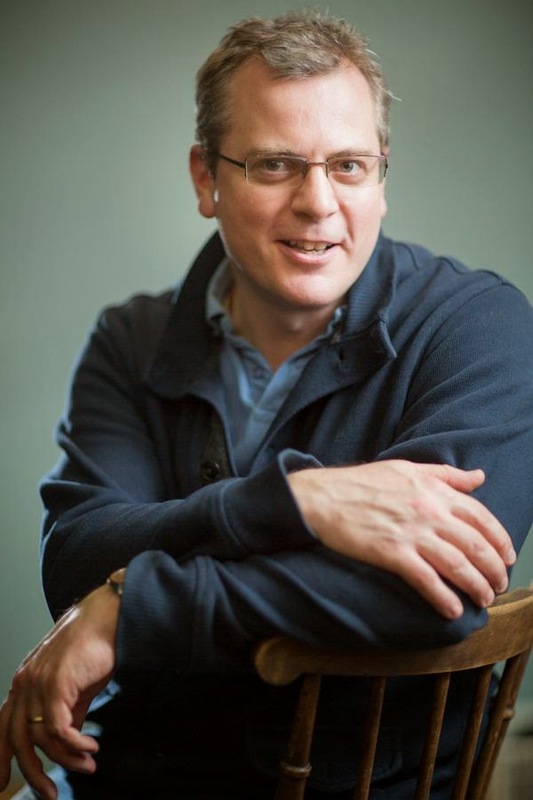 The British conductor Stuart Stratford has been appointed the new music director of Scottish Opera. He joins the company in June this year and his first performances as music director will be announced as part of the 2015/16 season launch in May. Stuart Stratford recently conducted critically lauded performances of Jancek's Jenufa with Scottish Opera (you can read review by Christopher Lambton over on The Arts Desk). The search ends something of a hiatus for the company after the precipitate departure of Emmanuel Joel-Hornak in April 2013, and will hopefully bring an element of stability to standards in the company at a time when it is much needed. Stuart Stratford was born in Preston, but his mother was from Clydebank. This will be his first music director post in an opera company, but he has been gaining plaudits for his thoughtful musical approach. We have seen him in the pit at Buxton with Gluck's Orfeo in 2014 (see my review) and the double bill in 2012 (see my review), at Opera Holland Park with La Fanciulla del West in 2014 (see my review), Cav and Pag in 2013 (see my review) and Lucia di Lammermoor at Opera Holland Park in 2012 (see my review) and he has worked regularly with Opera North. The 2015 London Handel Festival came to an end on Monday with the 14th London Handel Singing Competition at St George's Church, Hanover Square. Five finalists competed, soprano Ingrida Gápová, soprano Sarah Hayashi, baritone Josep-Ramon Olivé, mezzo-soprano Maria Ostroukhova and soprano Alice Privett, before a distinguished jury consisting of (Ian Partridge, Edward Blakeman, Catherine Wyn-Rogers, Catherine Denley and Michael George). The singers were accompanied by members of the London Handel Orchestra, directed by Laurence Cummings. The competition has a knack of choosing its winners well, past singers have included Andrew Kennedy, Elizabeth Atherton, Ruby Hughes, Sophie Junker and Nathan Vale. And winners have a welcome habit of returning in later festivals too. 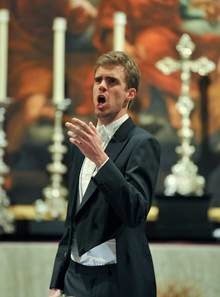 Rupert Charlesworth (who took first prize in 2013) sang Jove in this year's Semele alongside one of the 2014 winners. The Handel repertoire does, of course, favour certain voice types though I remember the quality of Argentinian bass Lisandro Abadie who was a finalist in 2008. So it pleasing that this year Spanish baritone Josep-Ramon Olivé took first place, winning the Regina Etz Prize as well as winning the Michael Normington Audience Prize. Josep-Ramon Olivé is currently on the Opera Course at the Guildhall School of Music and Drama, currently studying under Professor Rudolf Piernay. At the final he sang a recitative and aria from Tamerlano, 'Vouchsafe, O Lord' from the Dettingen Te Deum and arias from Giulio Cesare in Egitto and Lotario. 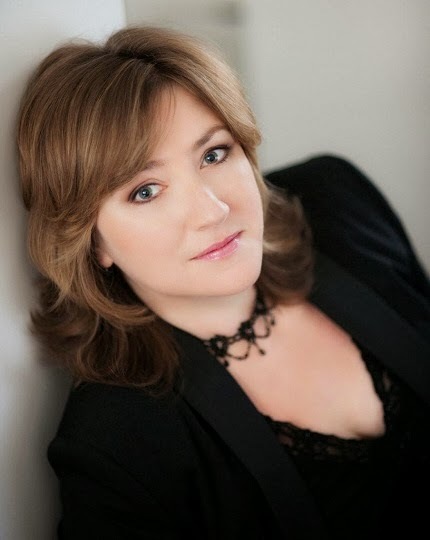 Russian mezzo-soprano Maria Ostroukhova took second place, with the Michael Oliver Prize, singing aria from Giulio Cesare in Egitto and Giove in Argo. Josep-Ramon Olivé and Maria Ostroukhova each receive a cash prize and a performance at the 2016 London Handel Festival, and the other two performers will be offered a lunchtime recital. Covent Garden announced its 2015/2016 season last week and Kasper Holten's Royal Opera season has been eagerly picked over by everyone, itemising the amount of contemporary opera, the number of old war-horses making a reappearance and the paucity of Jonas Kaufmann showings. What is clear is that, whatever you think of Kasper Holten's extensions to the repertoire and introduction of more innovative productions, this is being paid for by a series of securely bankable revivals of core classics; a lesson which has not yet been quite learned over in St Martin's Lane. So what is there to look forward to? Well, quite a lot actually; Kasper Holten and his team do seem to have a knack of identifying interesting areas for revival. Yes, there is a paucity of Britten, Janacek and such, but we do have Chabrier, Mussorgsky, Luigi Rossi, Enescu, Gluck and Georg Friedrich Haas. 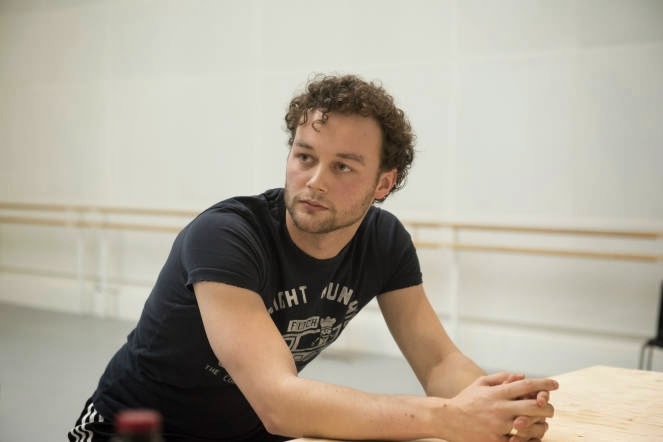 Kasper Holten's own productions have so far, rather divided opinion and whilst his Yevgeny Onegin gets a revival, he is not at the helm of any of the new productions. New productions include Gluck's Orphee et Eurydice (note the language) with Juan Diego Florez, Lucy Crowe and Amanda Forsythe. Choreographer Hofesh Schechter and John Fulljames jointly direct and John Eliot Gardiner conducts the Monteverdi Choir and English Baroque Soloists. Continuing the Orpheus theme, Luigi Rossi's Orpheus (the opera with which Cardinal Mazarin hoped to introduce Italian opera to France) is being directed at the Sam Wanamaker Playhouse by Keith Warner with Christian Curnyn and the orchestra of the Early Opera Company. Christoph Loy's unlovely production of Lucia di Lammermoor is being replaced by a new one from Katie Mitchell. Daniel Oren conducts with Diana Damrau and Aleksandra Kurzak sharing the title role, Charles Castronovo and Stephen Costello sharing Edgardo and Ludovic Tezier and Artur Rucinski sharing Enrico. The combination of Katie Mitchell and Lucia is an interesting one and I can't wait to see what effect her detailed style of production will have on the work, though I do wish they had chosen a conductor more in the Charles Mackerras mould to bring the same new ears to the orchestral sound. 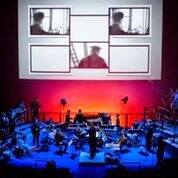 Three Tales, the video opera by Steve Reich and Beryl Korot was premiered at the Vienna Festival in 2002 and broadcast by the BBC that year. The piece, which is similar in construction to Steve Reich and Beryl Korot's The Cave (1990-1993), is written for two sopranos, three tenors, string quartet, percussion, keyboards, and pre-recorded audio, with visuals by Beryl Korot. 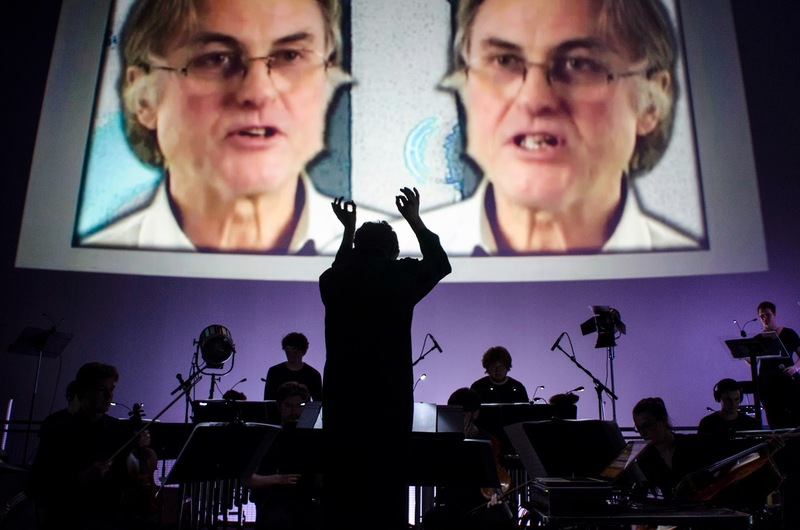 There is a chance to experience it in an IMAX Cinema as this week, on 22 and 24 April 2015, the Ensemble BPM will be performing the work at the Science Museum (a very appropriate location given the work's examination of technology in human history). The production will be presented in association with the Institute of Historical Research’s conference: Being Modern: Science and Culture in the early Twentieth Century. The first performance will mark the centenary of the first use of chemical weapons in warfare 22 April 1915. Ensemble BPM is only the second group to perform the work since its 2002 premiere. They will be joined in performance by Synergy Vocals, led by former Swingle Singer Micaela Haslam. The production is conducted by Ensemble BPM's artistic director Nick Sutcliffe and directed by Matthew Eberhardt. Further information and tickets from the Science Museum website. 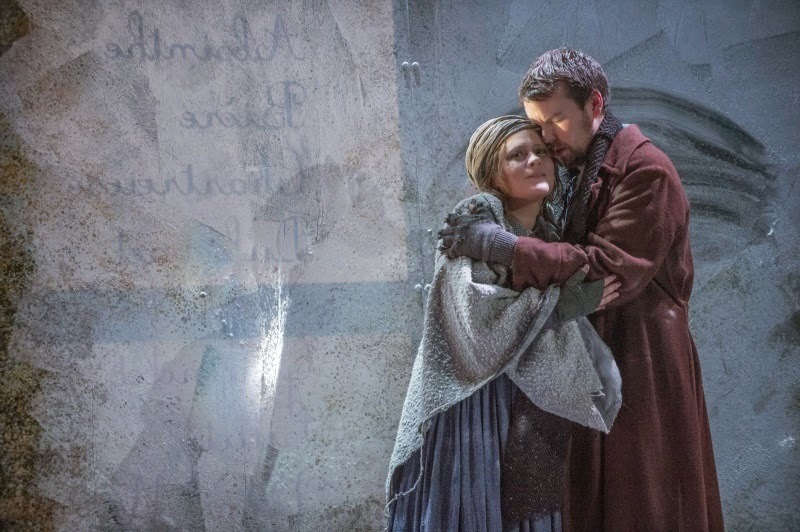 The English Touring Opera's (ETO) current season includes the beautifully enacted 'La Boheme'. Performed at Hackney Empire, directed by James Conway, and conducted by Michael Rosewell, (13 March 2015) this Puccini classic kept a traditional feel with its classic costuming, yet was enhanced by its clever and quite modern multifunctional staging designed by Florence de Maré. The crowd scenes and the children added to atmosphere of 19th century Europe, and the main roles were sensitively performed – necessitating discreet use of hankies. Giacomo Puccini (1858-1924), born in Tuscany to a musical family, was expected to continue the long tradition of becoming the maestro di cappella of the Cattedrale di San Martino in Lucca. However after studying at the conservatory in Milan he was persuaded to write his first opera 'Le Villi' in 1883. 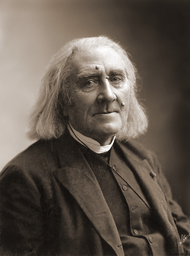 By 1893, with 'Manon Lescaut', his skill at opera was renowned worldwide. 'Manon' had its share of troubles including several false starts with different librettists. The final pair, Luigi Illica and Giuseppe Giacosa, became long term collaborators - working with Puccini on his next opera project 'La Boheme'. The concert at Milton Court Concert Hall on Friday 17 April 2015 was a showcase for the chamber music of Howard Blake (born 1938). 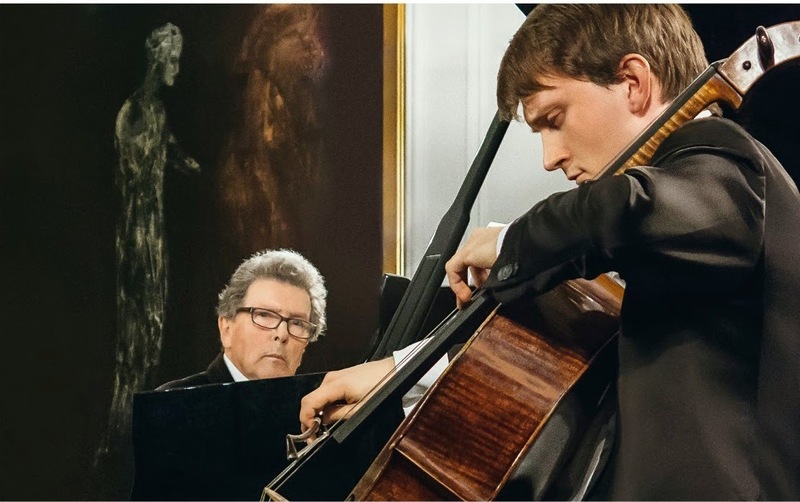 The group of musicians consisted of the young German cellist Benedict Kloeckner, who has developed something of a name for himself playing Howard Blake's music, with violinist Madeleine Mitchell, viola player Rivka Golani, and pianist Sasha Grynyuk. The pianist was supposed to be Howard Blake himself, but in the event a broken arm prevent his playing, and we were lucky enough to get Sasha Grynyuk, who learned the taxing programme specially. The musicians came together in various combinations, with the Prelude for solo viola, Diversions and The Enchantment of Venus both for cello and piano, Piano Trio No. 3 Elegia Stravagante and Piano Quartet. The concert opened with Howard Blake's Piano Trio No. 3, Elegia Stravagante which was written in 2014 and premiered by Howard Blake and Benedict Kloeckner, with Linus Roth, in Koblenz. In seven movements, the work is based on a melody which is first stated in the opening Andante (rapsodico) movement. It is a wistful, elegant and rather thoughtful melody, by turns dramatic and elegiac, which Howard Blake subjected to a variety of treatments including elements of jazz/blues, and a big solo moment for the cello. Despite the romantic textures of the work there was a clarity and elegance to the performance. 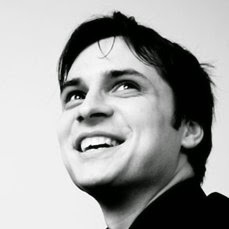 Benedict Kloeckner won the 2010 European Broadcasting Union competition playing Howard Blake's Diversions for cello and piano, and he and the composer have played it on subsequent occasions and recorded it. The work was originally written in 1983 and Howard Blake developed the cello part in conjunction with the French cellist Maurice Gendron, so it is a bravura and challenging work. 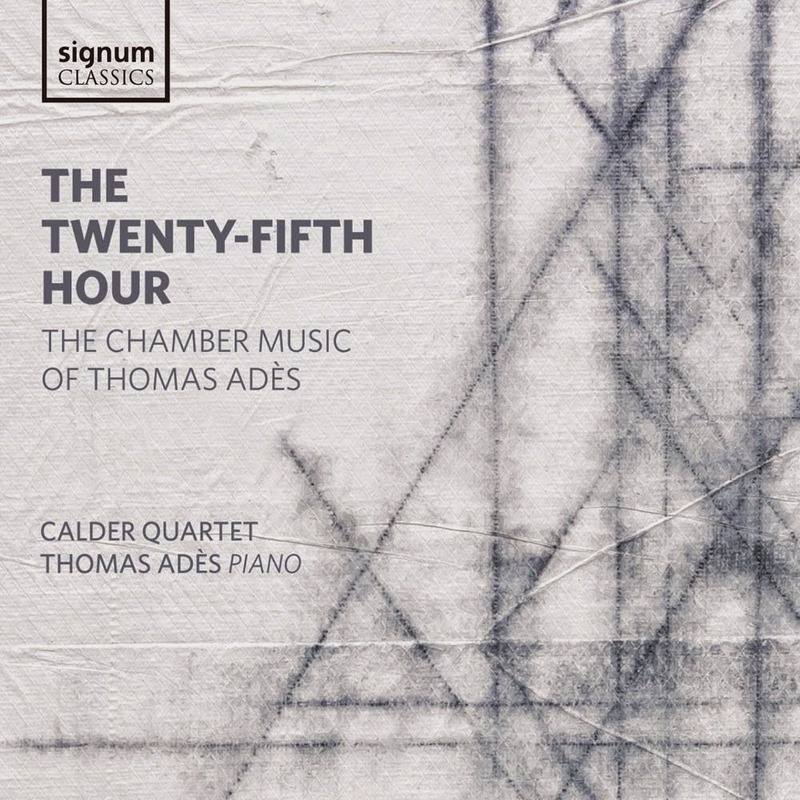 It is an eight-movement suite which starts with a Prelude with a long-breathed and elegant melody which was given an intense, sung performance from Benedict Kloeckner, who played the piece from memory. A jazz-like, skittering Scherzo followed, then a darkly dramatic March with a big tragic cello tune. The Waltz had jazz-like hints too, and despite the technical challenges it was clear that Benedict Kloeckner was enjoying himself. The slow moving, elegiac Aria was followed by a rhythmically catchy Serenade which circled round endlessly, followed by a Cadenza which was full of brilliant details, and thoughtful moments. The Finale was very up tempo with fast and furious passage-work. Benedict Kloeckner played with concentration, depth and intensity, and a remarkable maturity, giving a performance which was deeply felt. He was finely supported by pianist Sasha Grynuk, in a piano part which perhaps less bravura than the cello part, but no less challenging. After the interval the distinguished viola player, Rivka Golani, played Prelude for Solo Viola, which was written by Howard Blake as a prelude to his oratorio Benedictus in 1980 and it was prepared as a solo concert piece in 1989 by the viola player Frederick Riddle. It was a rhapsodic, rather darkly lyrical work using lots of strenuous string crossing and double stopping. Not an easy piece by any means, and it got remarkably violent at times. The Enchantment of Venus was originally written in 2006 for basset clarinet and piano, for Colin Lawson who gave the work's premiere. The version for cello and piano was premiered in 2014 by Benedict Klockner and Howard Blake in 2014. The work has a mythological narrative, which Howard Blake bases around a lyrical, melancholic melody which he subjects to some strenuous dramatic development and turmoil, before finishing with beautifully simple, elegant melody. As before Benedict Kloeckner played from memory and gave a deeply felt performance, singing the final melody with great beauty. The last work in the programme was the earliest, the Piano Quartet (for piano, violin, viola, cello) which was written in 1974 and premiered in 1975. The opening Allegro con anima was a long, complex and highly structured movement which felt very impulsively romantic and based round an animated, long-breathed melody. The whole movement had the feeling of being inspired by Dvorak's piano-based chamber music, and this carried over into the second movement, Presto (Scherzo). This was fast and furious, with fragments of melody being passed around. There were a pair of trios, the first lyrical relaxed, the second quieter and darker and more off-beat. The third, slow movement, Lento espressivo had long intertwining lines for the strings over repeated piano chords, with a magical end. The finale, Allegro robusto started out robust and carefree, almost a country gardens feel, but then the composer moved us rapidly through a variety of moods by turns darkly dramatic and slow, before a conclusion which seemed to evoke the material from the opening. The four performers, combing together in various combinations throughout the evening, all played with a strong commitment and feel for Howard Blake's music, often with some quite challenging writing. And throughout, there was a lovely feeling of chamber interaction and collegiality. In style the music was varied, but always complex and full of interest; Howard Blake's music might be tonal, but it is never simple. And as a treat at the end, the four performers came together to play and arrangement of the composer's best known tune. Howard Blake and Benedict Kloekner's new disc is now available from Genuin and the disc was featured on Deutschlandfunk radio in Berlin last night.